The suspect in last month's aggravated robbery at Bank of America has been identified. Tarrant County is thousands of miles away from the epicenter of the nation’s opioid epidemic, but health officials have created a strategy that has helped react to the crisis. This is an inside look into the rise, wreckage and recovery of the opioid crisis in Tarrant County, Texas. A Fort Worth marathon runner was mauled Sunday afternoon by an unleashed pit bull. 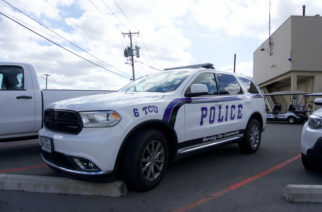 The Fort Worth police department is currently investigating two cases involving a police officer impersonator; the most recent of which was near TCU. A main water pipe broke outside of Moudy North. The TCU police are investigating a reported sexual assault. A female student accused a male student of sliding a cell phone underneath the wall of a restroom stall to record her. Safety cameras are located all over campus to deter criminals. The victim said the suspect tried to take her purse but was unsuccessful.